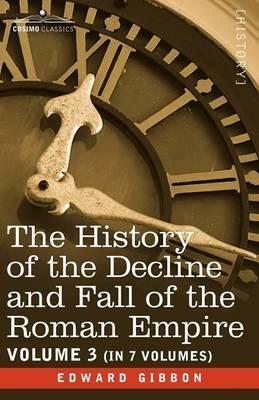 The History of the Decline and Fall of the Roman Empire is Edward Gibbon's magnum opus, written and published over a 13-year period beginning in 1776. It not only chronicles the events of the downfall starting with the end of the rule of Marcus Aurelius, but proposes a theory as to why Rome collapsed: the populace, Gibbon theorizes, lost its moral fortitude, its militaristic will, and its sense of civic duty. History is considered a classic in world literature, and Gibbon is sometimes called the first "modern historian" for his insistence upon using primary sources for his research. Many scholars today still use his highly regarded work as reference. In this third of seven volumes, readers will find Chapter 25 ("Reigns of Jovian and Valentinian, Division of the Empire") through Chapter 35 ("Invasion by Attila"), which cover the rules of Jovian, Valentinian, Valens, Gratian, Theodosius, Arcadius, Honorius, Eutropius, and Valentinian III; wars in Germany, Britain, Africa, and Persia; the Gothic War in 376; the conversion of Rome; the revolt of the Goths; the numerous sackings of Rome by the Goths and Charles V; revolutions in Gaul and Spain; the life of Saint John Chrysostom; the life of Empress Eudocia; the progress of the Vandals in Africa; and the invasion of the Roman Empire by Attila the Hun. English parliamentarian and historian EDWARD GIBBON (1737-1794) attended Magdelan College, Oxford for 14 months before his father sent him to Lausanne, Switzerland, where he continued his education. He published Essai sur l'Etude de la Litterature (1761) and other autobiographical works, including Memoire Justificatif pour servir de Reponse a l'Expose, etc. de la Cour de France (1779)."